American Standard, one of the leading makers of high-quality bathroom fixtures, launches its latest and most luxurious line of products that promises to make any home the envy of the neighborhood. The latest line of shower heads, lavatories and water closets highlights the company’s commitment to design quality and innovation that it has long been known for. “These new product lines represent American Standard’s uncompromising belief in the growing sophistication of the market. These products are here because of extensive product research into what the consumers want and what they need.” said Noel Tolosa, American Standard marketing manager. As a trendsetter in the design and innovation sector, American Standard has always ensured that its designs remain relevant to the needs of today’s families and to today’s times. Conceptualizing for today’s modern dwellings The company launched the Concept Cube, a line of compact but beautiful and stylish bathroom fixtures. The Concept Cube seamlessly blends the sleek modern lines with innovative technology, using strong and simple lines for a contemporary look. A signature soft inner rim that lends architectural style beautifully balances this and is ideal for even small bathrooms so common in today’s condominium housing. The Concept faucet series, on the other hand, complements the modern, compact and sophisticated styling of the water closets and lavatories. Made of high-quality chrome, these faucets make even small bathrooms chic and stylish. The faucet allows better water saving because it provides better control for users and being leak free. Satis Asteo It is said that the evolution of the water closet is a reflection of how civilized human living has become. This philosophy is reflected in the Satis Asteo water closet collection, which features amenities like LED dim lighting, soft music, automatic seat open and flushing, twin nozzle bidet, and air purification system that eliminates bad odors and airborne fungi and bacteria. The Satis Asteo reflects American Standard’s mantra of innovating on products to meet its customers’ changing lifestyles. 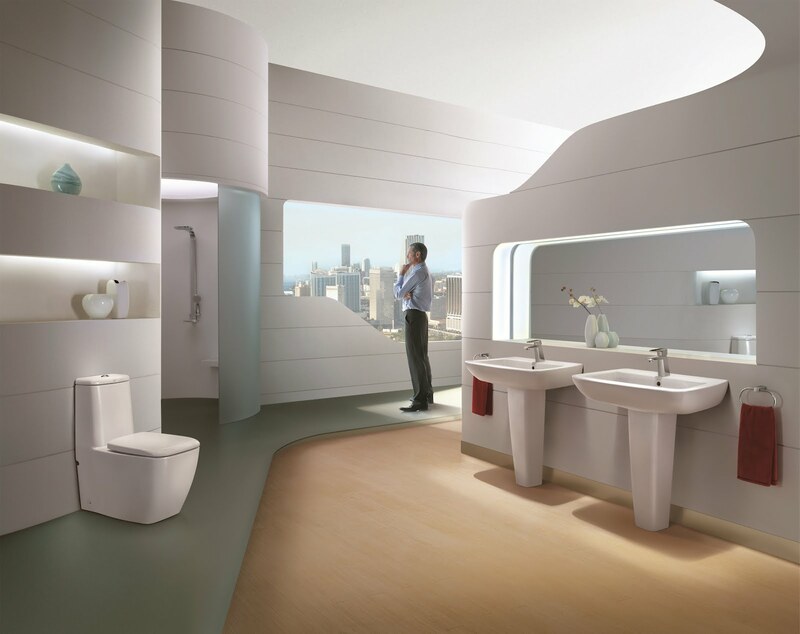 The EuroZen, on the other hand, brings the most innovative and convenient functions to bathroom hygiene in a sleek and compact water closet. With functions like siphon jet tornado flushing, powerful massage/cleanse function, deodorizer, warm dryer, nozzle with automatic cleaning, anti-bacterial nozzle, seat heater, and lift-off and slow- close seat cover, the EuroZen gives new meaning to luxury, comfort and high-tech to water closets and will make any bathroom a conversation piece. More vibrant colors mean more fun in the shower Looking at the company’s new line of shower heads, it is clear that the inspiration came from one thing: vibrant colors. The iColor Hand Showers evokes a fantasy world of plastic and bubble. Through a fascinating and playful concoction of art, science and technology, the iColor Hand Shower is well suited to today’s fun-loving and imaginative homeowner. The line of products pushes the boundaries of the human imagination—with refreshing results . Ventuno The Ventuno collection is designed by award-winning Italian designer, Franco Bertoli. It is an absolute choice for cosmopolitan consumers as it reflects the patterns of today’s urban architecture and elements of modern style. Designed with the sophisticated urbanite in mind, the Ventuno’s rounded, essentialized forms and geometric edges create sensations of pure harmony in every bathroom. World-Class and award-winning designers American Standard has always been setting trends in bathroom fixtures, not just in the aspect of technological innovation but in design as well. This is made possible by a highly creative team whose members are also into other industries such as automotive, fashion, home and furniture, and luxury items, among others. Some of the world’s most creative and award-winning industrial designers who design for American Standard are David Chipperfield, Ronen Joseph, Achim Pohl and Tomas Fiegl (Artefakt), Mark Sadler, Khumtong Jansuwan and Franco Bertoli, all of whom have earned awards from prestigious award-giving bodies. The American Standard’s new line of bathroom fixtures is available in major building materials depots nationwide.